Written by Chris Benjamin. Benjamin, director of food and beverage at the Essex Resort and Spa. One of the beautiful things about spirits is the versatility of products that are available on the market. You would think that there are only a finite amount of flavors that could be created with the materials on hand on this planet, but due to ingenuity and creativity, new products are released and invented every day. We recently had the privilege of hosting the Department of Liquor Control’s annual meeting here at The Essex Resort & Spa. It was an interesting time for us as we got to meet many of the creative minds behind these great products as they came to pitch their new products to the board. 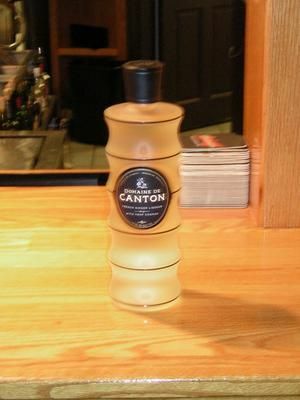 At this annual event, I sampled a few of the more interesting liquors and have a new one to share with you: Domaine de Canton. I’ve tasted many of the available ginger liqueurs, and most aren’t good. This one, however, is probably the best I’ve ever had, most likely due to the fact that Cognac is used as the base instead of vodka or grain alcohol. The first ginger-infused liqueur came from a ginger estate in Thailand. John Cooper, the son of famed Chambord importer NJ “Sky” Cooper, put a great spin on the recipe. He takes baby ginger that is culled, washed, peeled and cubed by hand, and then cooks it with spices and herbs in a cast iron pot. He blends this essence with VSOP and Grand Champagne Cognac, distills it twice, and ages it in French oak barrels. Finally, Cooper blends in ginseng, vanilla beans, and honey and then filters it. It’s a spectacular spirit. For those of you who love Jack & Ginger, add a splash of this to really spice things up. Or simply replace your ginger ale with Canton to create a dynamite martini. You can also use it in cooking—add some to your stir fry to deglaze the pan and infuse a ginger flavor into the dish. We recently combined it with Grey Goose La Poire (pear flavored), and I have to say it was a stellar combination. So, here is the recipe for our Pear Gingertini. It’s great as an aperitif or something to warm you up on these cold, snowy days. And Canton also makes a great gift. Fill a tumbler of ice with liquor and shake vigorously. Strain in a chilled martini glass. Garnish with pear chip. Using a very sharp knife, slice pears into thin sheets (using a mandolin makes this a lot easier and faster). On the stove top, create a simple syrup by simmering 2 parts water to 1 part sugar until sugar is dissolved. Continue to simmer, and add pears. Cook pears until translucent, about 8-10 minutes. Heat oven to 180 degrees. Remove pears from syrup and place on a cookie sheet lined with parchment paper (silk pads are even better). Dry in oven for 1-2 hours until crispy.